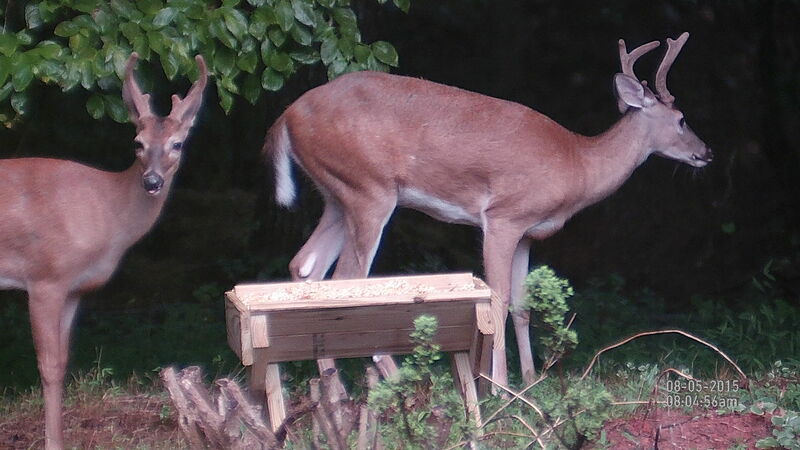 Since my wife is plagued with deer eating all her roses, I thought a good way to get some wildlife videos from the house would be to put a corn feeder in my back yard and see if I could get some wildlife on the camera. Fortunately there is an abundance of wildlife in my area and I soon had many eager subjects (deer, raccoons and possums). 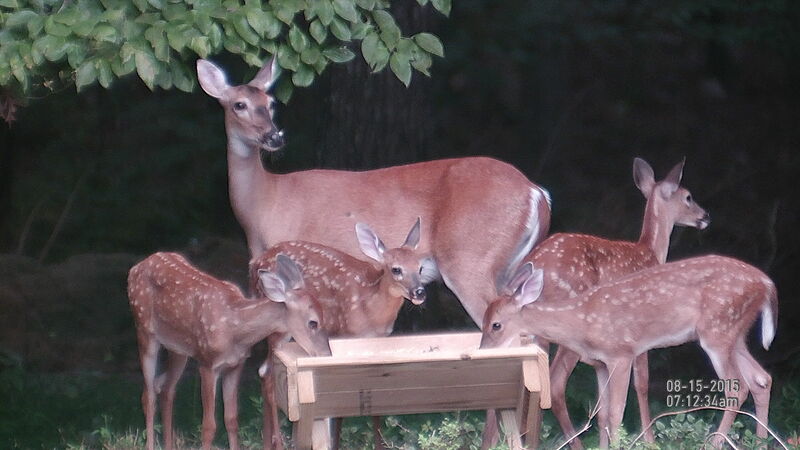 This next video shows four fawns and a doe eating from the feeder at a distance of about 35 yards. The video explains some things to consider while examining the video. Some items worth pointing out are listed below. Overall quality of the video and photos looks good. Photos are basically the same resolution as the video which is 1920x1080 (2.1 megapixels). Photos taken when zoomed in to something other than lowest resolution (3x or 5x depending on model) will be resampled up to be a resolution of 1920x1080, so if you are zoomed in you will start to see some grainy features in the photos. The amount of grainy-ness depends on how far you are zoomed in. When taking photos while recording the video at the same time, the reticle will not be displayed in the photo. There is no indication that a photo is being taken when you press the button while taking video. When you take a photo while not taking video, and while zoomed in, the screen will flicker, then zoom out and then zoom back in which gives you an indication that you actually took the photo. Colors in the video seem to be slightly more vivid than the photos. The photos seem to be slightly lighter than the same video image. These next two photos show a video image and a photo image to give you a comparison. The first image was captured directly from from the video. The second image was captured using the camera feature while actually taking video. You can see that the time stamps on the video and photo match. The photo directly below (Figure 1) is my best attempt at capturing an image from the video and you can see that the video colors seem more vivid than the photo image (Figure 2). The photos seems a little lighter and also notice that when taking a photo, while already taking video, that the reticle will not show in the photo. The reticle will show when taking photos while not taking video. If you click on the photo below or above, you will see the actual full size image captured by the X-Sight when taking a video or photo. I want to say again that I feel the overall quality of the video and photos looks good and I feel that if you take the time to look at these two images you will come to the same opinion. The thing you need to remember is that the reason the photos don't look great is that they are basically capturing the maximum resulting which is fixed by the video sensor in the X-Sight. If you stay zoomed out to 3x or 5x depending on your model, you will allow your photos to utilize the maximum resolution of the sensor. If you choose to zoom in and take photos, you need to understand that image resampling will occur and you will start to have image degradation just like you would with any other digital camera. The thing that make the degradation seem greater than normal is that we are all accustomed to high resolution digital cameras and smart phones and we all feel like we can zoom in closely on an image and not sacrifice detail. In defense of ATN, they are providing a riflescope package with IR illuminator and tons of features for what I consider to be a great price. To do this, I feel they need to give the consumer good quality and great value which again I feel they have. Perhaps they will at some point offer an ultra HD system, but until then, I think most people will be extremely happy with the X-Sight as is. A couple of days later from taking the photos and video above, I had the opportunity for six fawns to come into view at the same time around my feeder. This was one of those rare situations where having a camera or video ready to go made the difference between me capturing a moment for a lifetime versus just having a good story to tell. When stuff like this happens in the field, that is when the X-Sight's capability really shines because it can be there ready to record some of your most cherished moments at the push of a button. 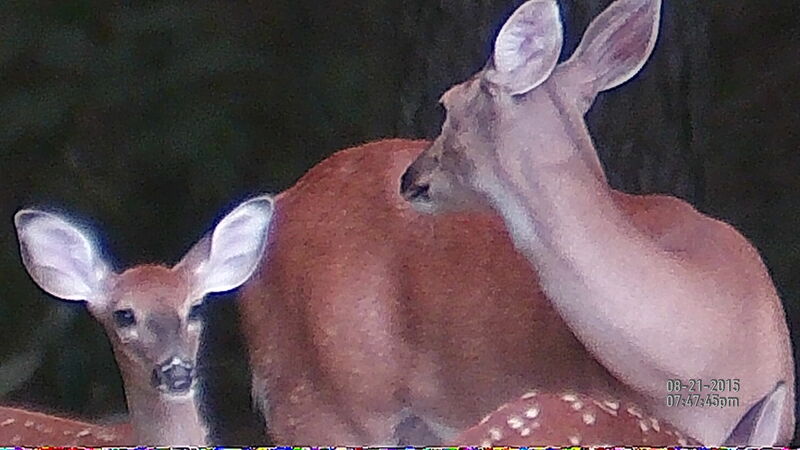 Another example of having your video or photo recording device ready to go is when these two bucks walked up to the feeder. They were extremely cautious and only stayed for a couple of minutes. This reminded me of how many times I see deer crossing a small clearing and they may be in the field of view for a minute or less. Sometimes it is all I can do to get my rifle up for a quick glance before they are gone. If you are using an X-Sight as a riflescope, then getting your camera ready is no different than shouldering your rifle. Keep in mind that the X-Sight has a sleep mode that is motion activated to wake the unit so having your X-Sight ready to go doesn't mean you are always using up battery life. Just like with the above two photos, these next two were taken when at 12.5x magnification (power). Even though these images are still good, you can start to see how the video and photo quality are starting to degrade due to the resampling occurring at this increased digital zoom magnification level. 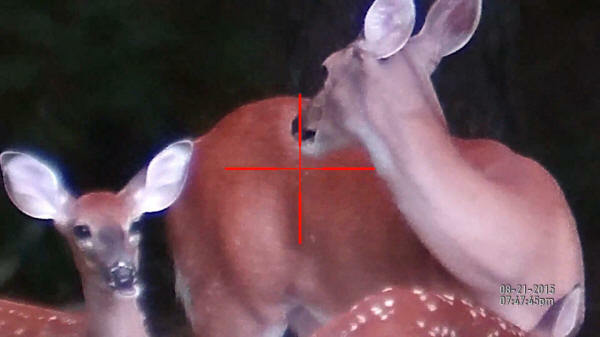 Since these deer are so close to the X-Sight, their size on the image helps to convey detail. At farther distances and with smaller images, zooming in may make crisp details in the images start to seem blended with the surrounding images. You can also see the slight differences in video image and photo image. I could continue making this same image comparison at greater magnification levels and the results would show increased image degradation due to how digital zooming works on any device. I decided to stop at the 12.5x power because this power represents a high end power on many hunting scopes on the market today. It also represents a point where you still get maximum clarity on the screen for the 5-18x model X-Sight which is the magnification level just before the screen starts to show decreases in image clarity due to the digital zoom feature resampling the image to make the image larger for the screen. In many of my videos I show zooming in at greater levels so make sure you check them out to give you an idea on what to expect. There is a good chance that you are going to see a reoccurring thought as I continue to put the ATN X-Sight into use watching wildlife. That thought will probably one like, "Wow, this is so cool!" In this part of the review, I was using the X-Sight looking out of a window in my home and I am only showing the daytime mode, yet when reflecting back on my hunting adventures over the last 40ish years, I wish I had something like the X-Sight to record all those amazing daytime moments. In my opinion, this riflescope's capability to record photos and video at the quality I have shown is well worth the price of the device even without considering the other features. I do feel it is important to say that if you are used to the image quality you get from high end glass, then you are going to have to recalibrate what might be important for your hunting situation to really appreciate the ATN X-Sight. 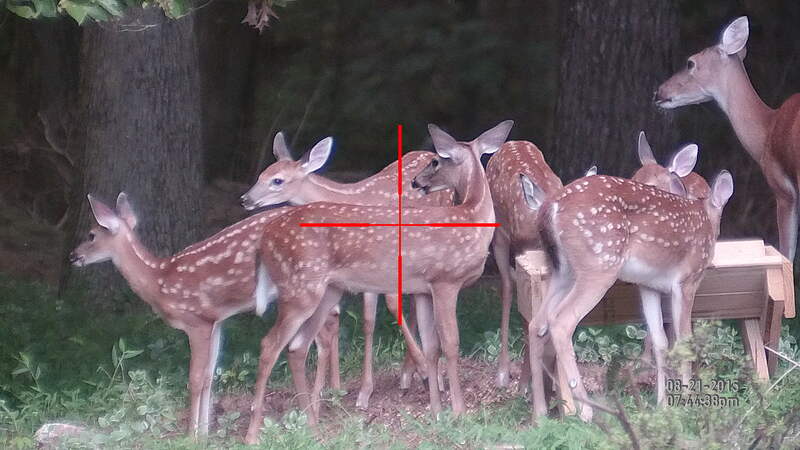 You do give up optical clarity for the features within X-sight, especially when you zoom in on a target. Yet, with he X-Sight, you get a device that can be used in both day and night situations along with the ability to stream video to another device wirelessly. And, you get all this for a bargain price of around $550 to $600 for the 3-12x model and $620 to $700 for the 5-18x model based on doing some online research. I still find this amazing.